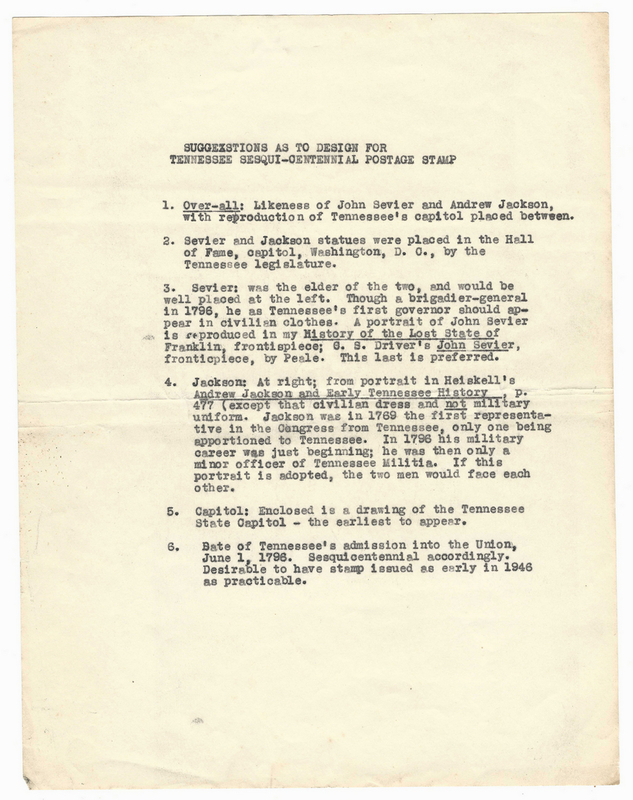 Large Samuel Cole Williams archive of Tennessee related papers and ephemera, 20 plus items. 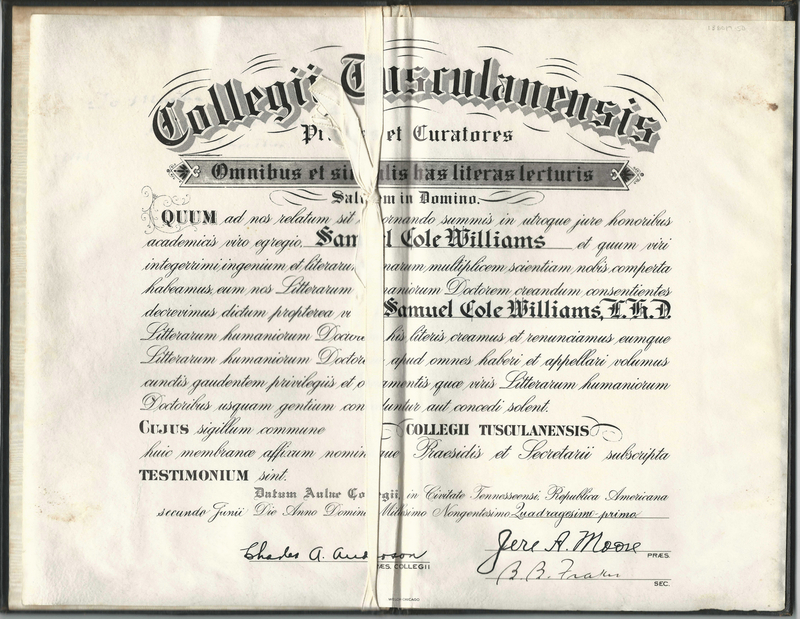 Samuel Cole Williams (January 15, 1864-December 14, 1947) was a noted 19th and 20th century Tennessee jurist, historian, educator, and businessman. 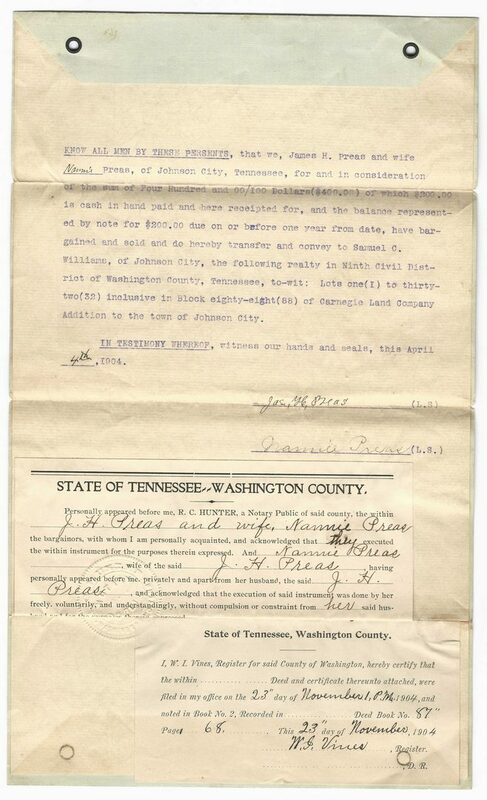 1st item: Land Deed between Williams and Mr. James A. Preas and Mrs. Nannie Preas, Johnson City, TN, in which they "have bargained and sold and do hereby transfer and convey to Samuel C. Williams, of Johnson City, the following realty in Ninth Civil District of Washington County, Tennessee, to-wit: Lots (I) to thirty-two (32) inclusive in Block eighty-eight (88) of Carnegie Land Company Addition to the town of Johnson City. 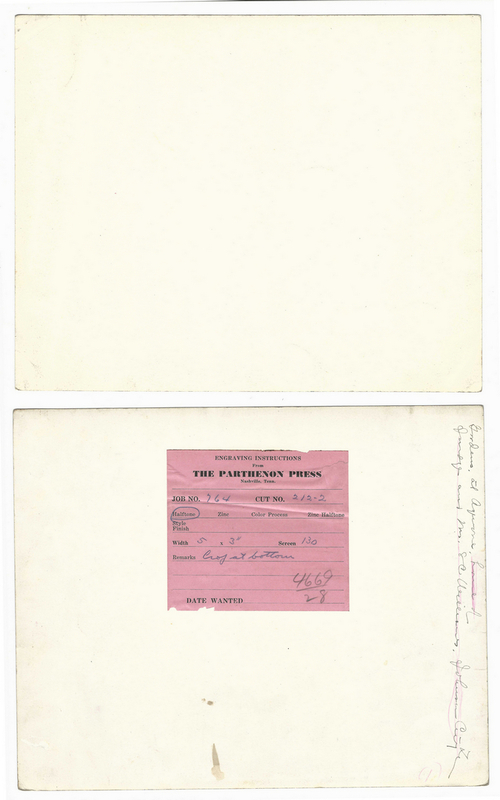 In Testimony Whereof, withness our hands and seals, this April 4th, 1904" for the sum of $400, signed by Mr. and Mrs. Preas, lower right. Notarized by R. C. Hunter, Notary Public of Washington County, TN, April 4th, 1904, entered into the register by W. I. Vines, Register for Washington County, November 23, 1904. 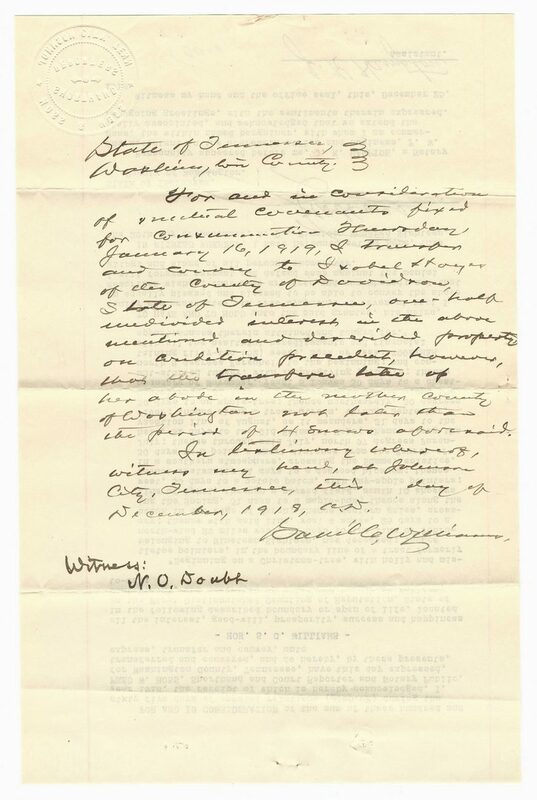 2nd item: Mock Land Deed between Williams and Fred W. Hoss, Shorthand and Court Reporter and Notary Public, Washington County, TN, in which Hoss "For and in Consideration of the sum of three hundred and sixty five days of cordial relations (#365.CR) during the year 1918, the receipt of which is is hereby acknowledged, [Hoss] [has] this day expressed, transferred and conveyed, and do hereby, by these presents, express, transfer and convery, unto Hon. 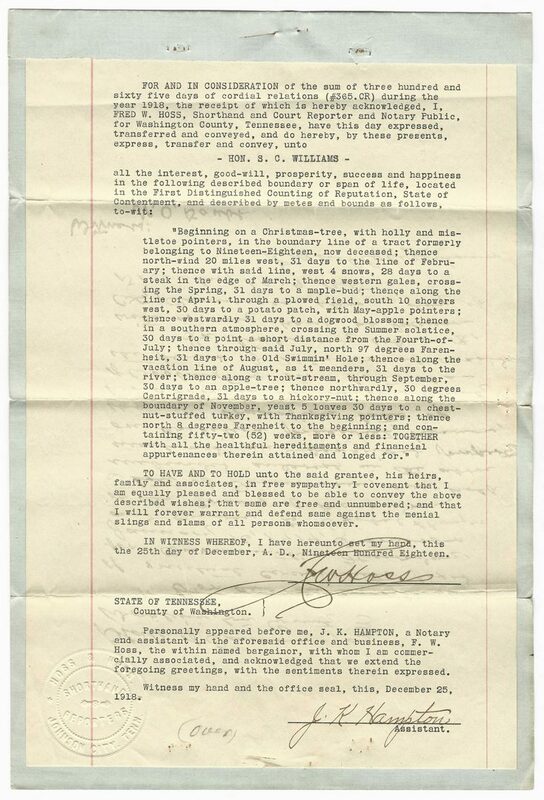 S. C. Williams all the interest, good-will, prosperity, success and happiness in the following described boundary or span of life, located in the First Distinguised County of Reputation, State of Contentment, and described by metes and bounds as follows…" witnessed by Hoss and assistant Notary J. K. Hampton, December 25, 1918. 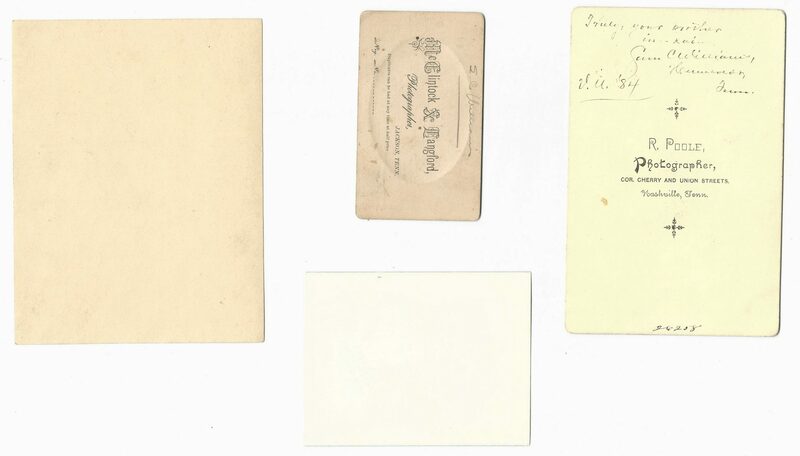 Handwritten note from Williams with signature, en verso. 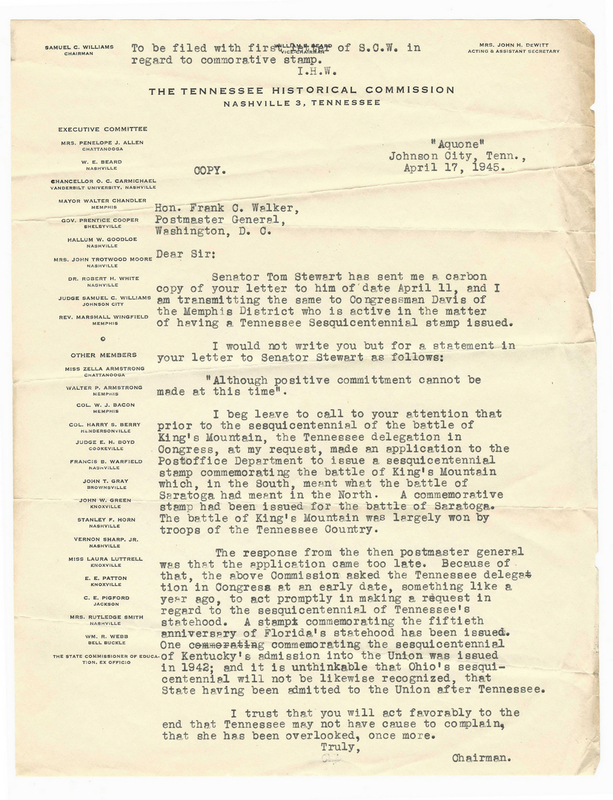 3rd item: Announcement pamphlet "To the People and Bar of Tennessee" in regards to his intention to stand as a candidate for the Supreme Judgeship of the Tennessee Supreme Court at the regular August election, 1914. 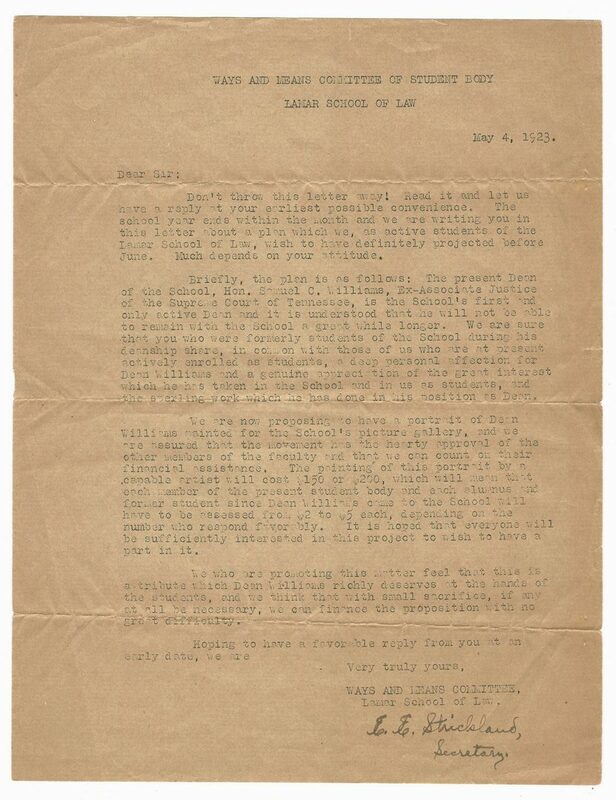 4th-7th items: Carbon copy of "Report of Law School", prepared by Williams, Dean of The Lamar School of Law, addressed to President Harvey W. Cox (1920-1942), Emory University, May 10, 1922. 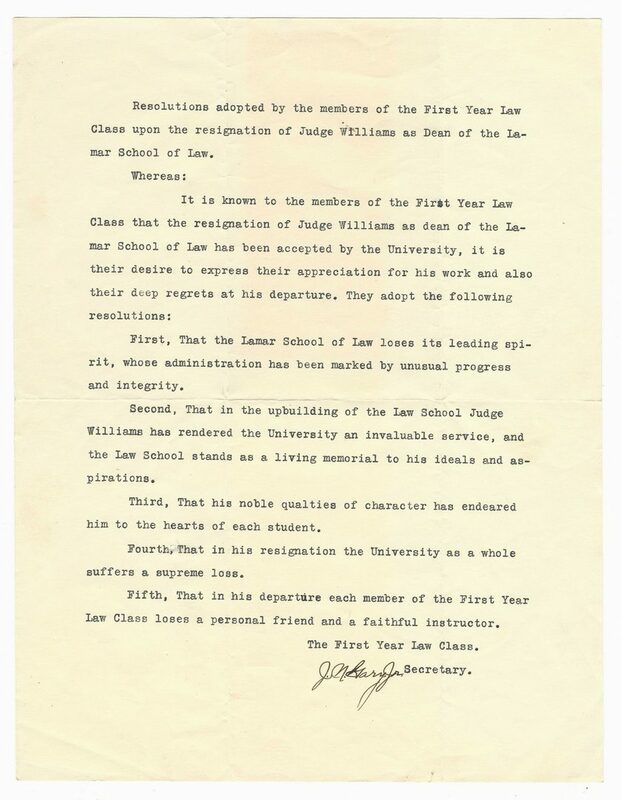 Williams writes "The Lamar School of Law shows a continued, and augumenting rate of increase of attendants; the aggregate for the current year being 71". 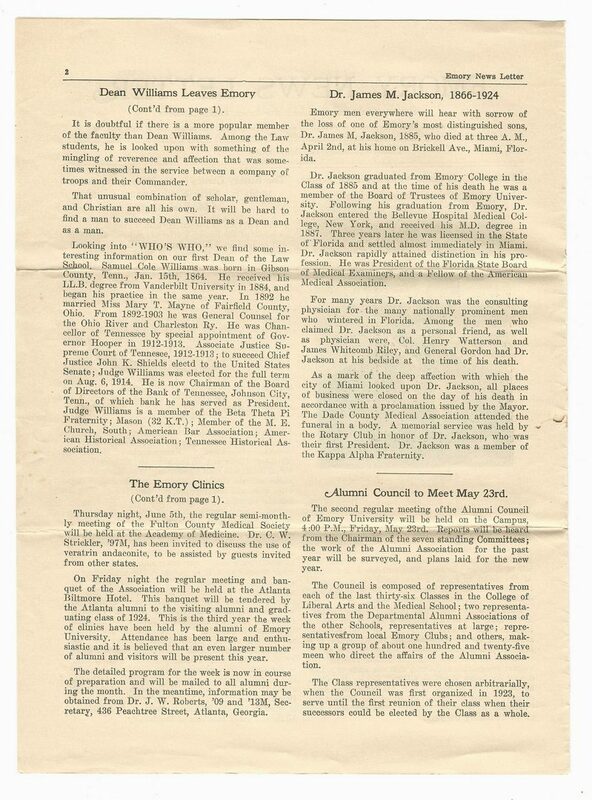 He later speculates that the number of student for the next year would be about 75 to 80, suggesting the creation of a dormitory for the exclusive use of the law students. 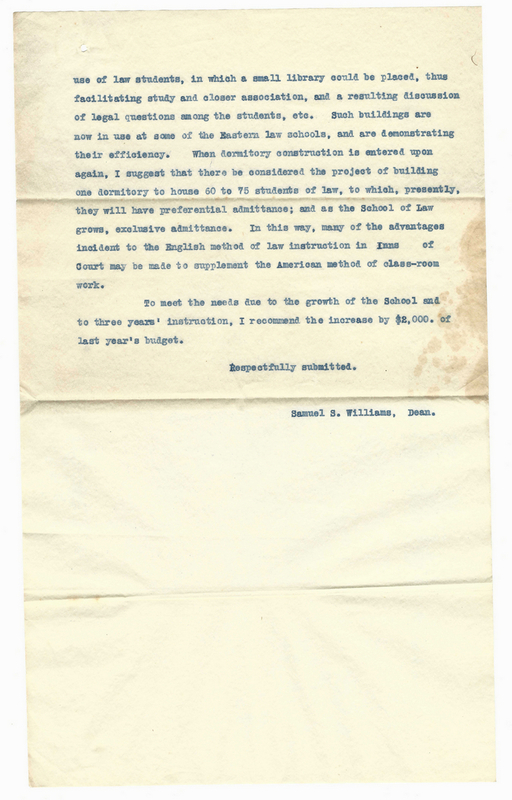 Williams ultimately recommends the increase of $2,000 over the previous year's budget "to meet the needs due to the growth of the School…". Includes a copy of the "Emory News Letter" Vol. II., No. 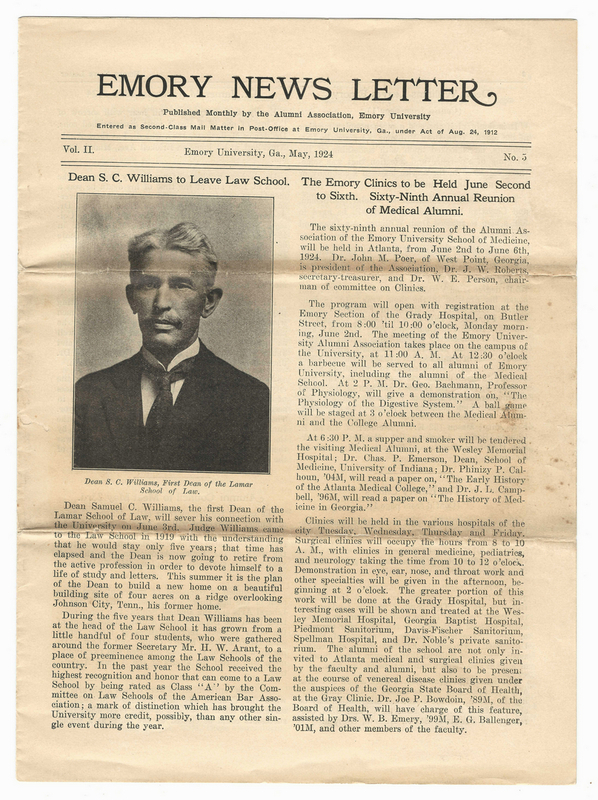 5, May 1924, announcing the resignation of Williams as Dean of the Law School. 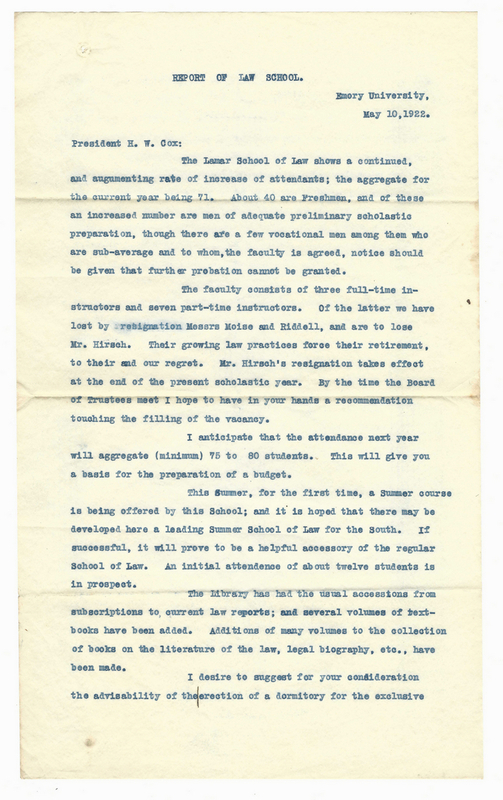 Also included are two letters from two student organizations at the Lamar School of Law in response to Williams' resignation, one from "Ways and Means Committee of Student Body" stating their intention to raise money for a portrait of Williams for the School's picture gallery, signed by Secretary E. E. Strickland, May 4, 1923, one from "The First Year Law Class" in which they state "Resolutions adopted by the members…upon the resignation of Judge Williams as Dean of the Lamar School of Law", signed by Secretary J. N. Gary, Jr., undated. 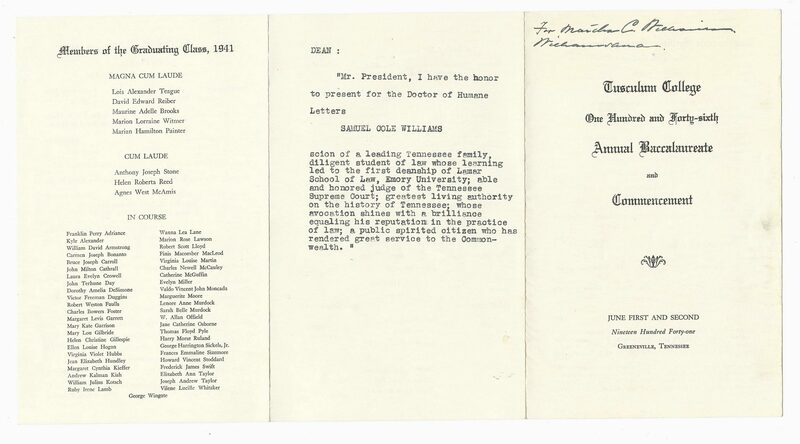 8th-9th items: Honorary Doctorate of Humane Letters from Tusculum College, signed by President Charles Albert Anderson (1931-1942), Acting President Jere A. Moore (1927-1928 and 1944-1946), and Secretary B. B. Fraker. 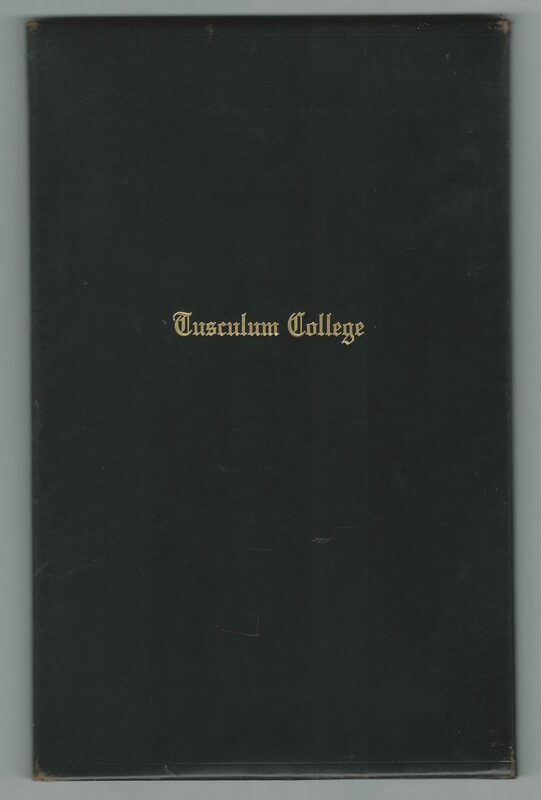 Secured to black leather diploma cover with off white ribbon, gilt lettering reading "Tusculum College", front of cover. 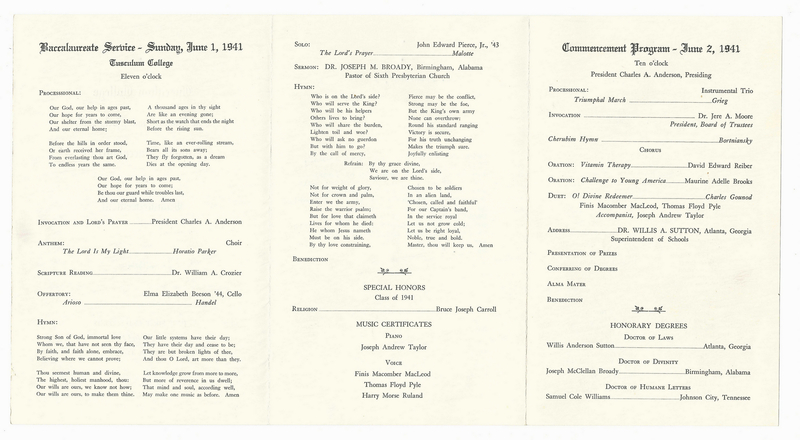 Also included is a program for the "Tusculum College One Hundred and Forty-sixith Annual Baccalaureate and Commencement June First and Second Nineteen Hundred Forty-one Greeneville, Tennessee". 10th-13th items: "Sugge[s]tions as to Design For Tennessee Sesqui-Centennial Postage Stamp" report copy, prepared by The Tennessee Historical Commission, with Williams as Chairman, with typed and handwritten notes by Williams. Addressed to Honorable Frank C. Walker, Postmaster General, Washington, D.C., by Williams from Aquone, Johnson City, TN, April 17, 1945. 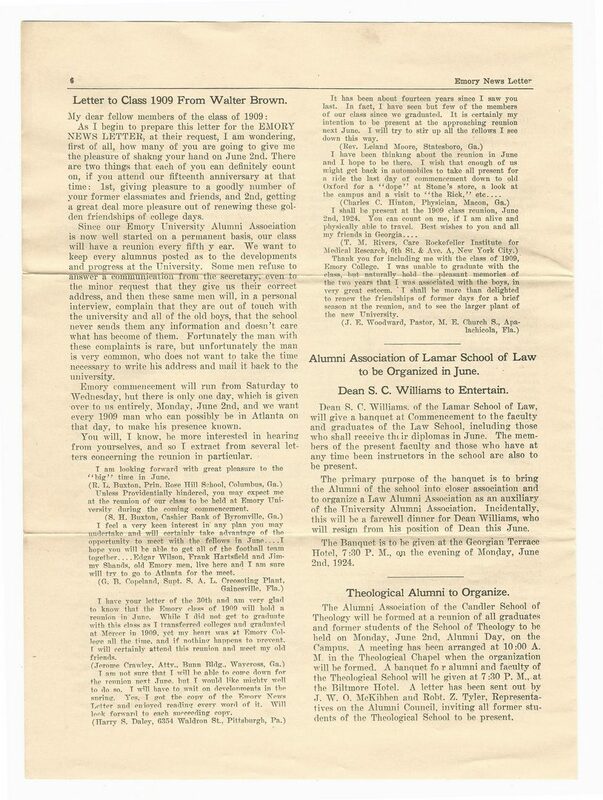 "Judge Samuel Cole Williams: Businessman, Jurist, Scholar and Historian" by Billy Joe Crouch, for Dr. Frank L. Williams, Jr., History 506, Recent American History, January 1956. 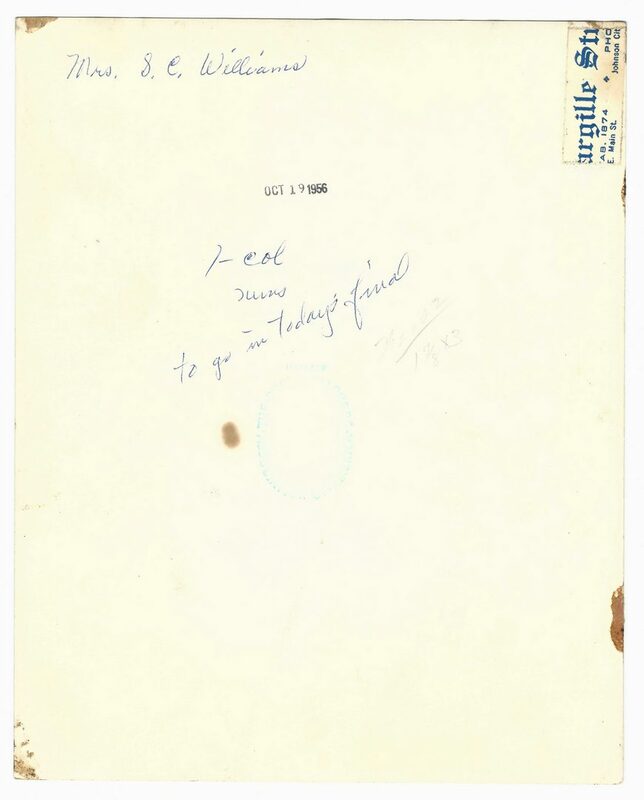 35 typed pages, housed in a grey folder. 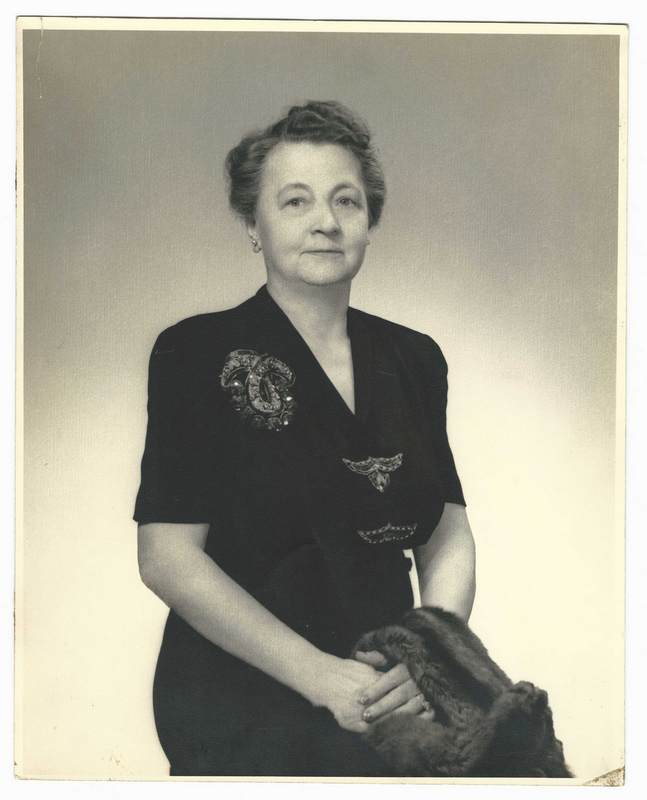 Two essays titled "Sycamore Shoals 1780-1930" by Amy May Rogers, undated. 14th-20th items: Seven Photographs including images of Williams as a child, taken by McClintock and Langford, Jackson, TN, and as a young man about to graduate from the Vanderbilt University School of Law, taken by Rodney Poole, Nashville, TN, with inscription reading "Truly, your brothers in- kai- Sam C Williams…V. U. '84". 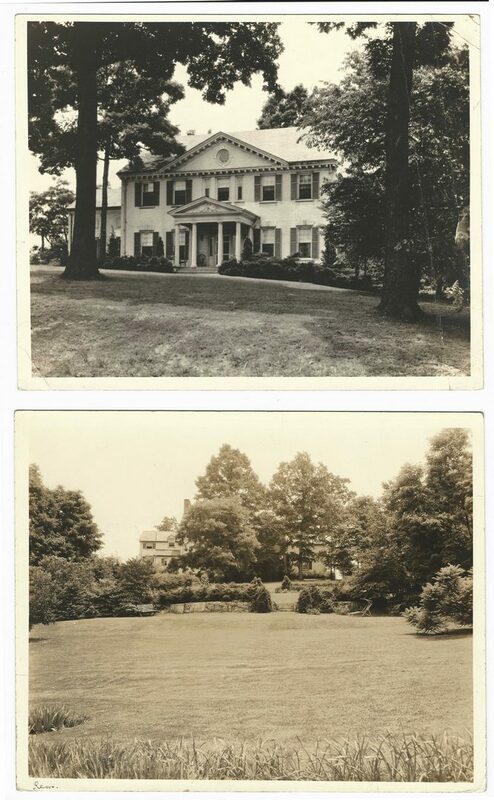 Also included is a photograph of his wife Isabella Hayes Williams, dated October 19, 1956, and two photographs of Aquone, Johnson, TN, one of the house and one of the gardens, undated, and two photographic copies of portraits of Williams, undated. Also included are invitations to events, a postcard, newspaper clippings, and copies of biographical information about Williams or other historical figures. 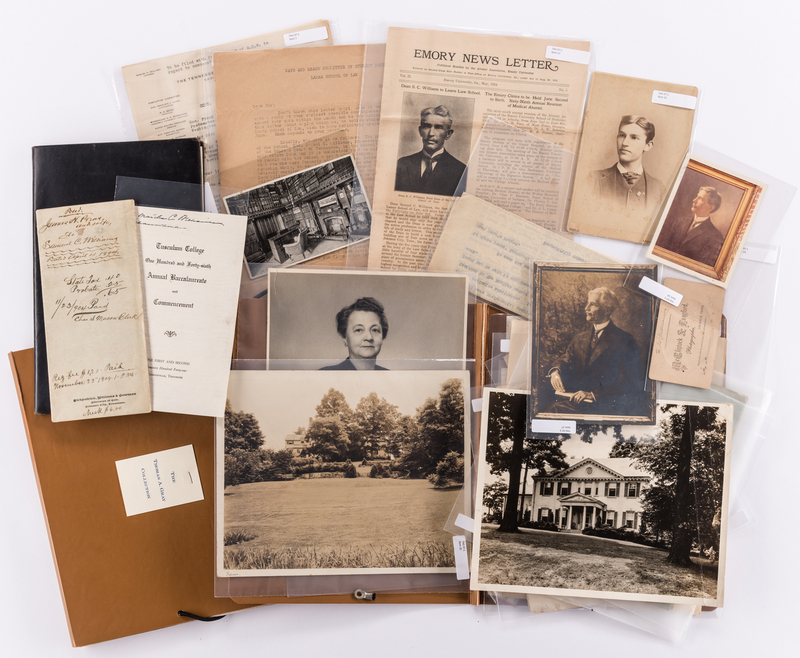 All items housed in two plastic brown archival folders. Provenance: Anne P. and Thomas A. Gray Library and MESDA Research Center. CONDITION: Overall good condition. 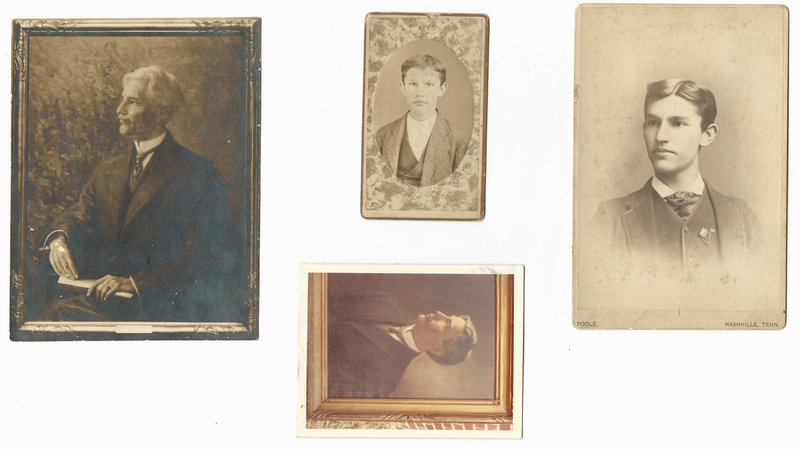 Some items exhibit toning, dampstaining, tears, wear commensurate with age.